Florida State University art professor and nationally recognized sculptor Ed Love died suddenly on March 22, 1999. He was 62. Love was born on September 21, 1936. He earned a BFA in 1966 and an MFA in 1967 from California State University at Los Angeles. He also studied at the University of Uppsala in Sweden as a postgraduate fellow. In 1969, he joined the faculty of the department of art at Howard University, where he was seen as an inspirational force for 18 years. From 1987 to 1990, he was the founding dean of the art division of the New World School of the Arts in Miami. In 1990, he became professor of art and director of undergraduate studies at Florida State University. 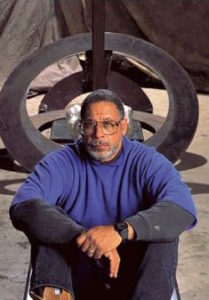 Love truly became a prominent artist in 1976 with a solo showing of his sculptures at the Corcoran Gallery of Art in Washington, DC. Upon moving to Tallahassee in 1990 and taking up teaching at FSU, he also occupied a studio space in Railroad Square. Now, his work lives in the permanent collections of the High Museum in Atlanta and Yale University. Love’s legacy continues on FSU’s campus in the Ed Love Sculpture Garden, which displays student work. I had found in Ed’s company and teachings, a way to approach my own work, and I think so far it’s paid off. I’m going to miss Ed Love, the person, the teacher, as I am sure hundreds of his students will, and all I can find comfort in is his work, his words to me, and the times that I will walk or drive by both the FSU Museum and his studio at Railroad Square and think of the man, his towering person there, at work, ready to embrace me and give me that much needed stabilizing hug. I will dream and in my dream I will be in a garden in the company of Ed’s sculptures, standing erect, proud, majestic, like that man who molded and shaped the beauty of his own self out of so much scrap metal. Love is survived by his wife Monifa, a prominent writer and performer, son Scott, who maintains his portfolio online in his memory, and daughter Nia, a performer and choreographer.